For other places with the same name, see Peckham (disambiguation). 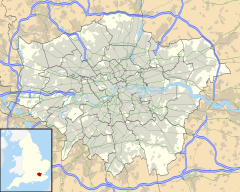 Peckham (/ˈpɛkəm/) is a district of south-east London, England, within the London Borough of Southwark. 3.5 miles (5.6 km) south-east of Charing Cross. At the 2001 Census the Peckham ward had a population of 14,720. Peckham appears in Domesday Book of 1086 as Pecheham. It was held by the Bishop of Lisieux from Odo of Bayeux. Its Domesday assets were: 2 hides. It had land for 1 plough, 2 acres (8,100 m2) of meadow. It rendered 30 shillings (£1.50). Peckham became popular as a wealthy residential area by the 16th century and there are several claims that Christopher Wren had local links. By the 18th century the area was a more commercial centre and attracted industrialists who wanted to avoid paying the expensive rents in central London. Peckham also boasted extensive market gardens and orchards growing produce for the nearby markets of London. Local produce included melons, figs and grapes. The formal gardens of the Peckham Manor House, rebuilt in 1672 by Sir Thomas Bond were particularly noticeable and can be seen on the Rocque map of 1746. The manor house was sacked in 1688, as its then owner Sir Henry Bond was a Roman Catholic and staunch supporter of James II. The house was finally demolished in 1797 for the formation of Peckham Hill Street, as the Shard family developed the area. Today Shard's Terrace, the block that contains Manze's Pie and Mash shop, and the western side of Peckham Hill Street represent this Georgian planned expansion. In 1767 William Blake visited Peckham Rye and had a vision of an angel in a tree. In 1993, at the request of the Dulwich Festival, artist Stan Peskett painted a mural of Blake's vision next to the Goose Green playground in East Dulwich. At the beginning of the 19th century, Peckham was a "small, quiet, retired village surrounded by fields". Since 1744 stagecoaches had travelled with an armed guard between Peckham and London to give protection from highwaymen. The rough roads constrained traffic so a branch of the Grand Surrey Canal was proposed as a route from the Thames to Portsmouth. The canal was built from Surrey Commercial Docks to Peckham before the builders ran out of funds in 1826. The abbreviated canal was used to ship soft wood for construction and even though the canal was drained and backfilled in 1970 Whitten's timber merchants still stands on the site of the canal head. In 1851 Thomas Tilling started an innovative omnibus service from Peckham to London. Tilling's buses were the first to use pre-arranged bus stops, which helped them to run to a reliable timetable. His services expanded to cover much of London until his horses were requisitioned for the Army in the First World War. Before Peckham Rye railway station was opened in 1865 the area had developed around two centres: north and south. In the north, housing spread out to the south of the Old Kent Road, including Peckham New Town, built on land owned by the Hill family (from whom the name Peckham Hill Street derives). In the south, large houses were built to the west of the common land called Peckham Rye and the lane that led to it. A map showing the Peckham wards of Camberwell Metropolitan Borough as they appeared in 1916. With the arrival of the railway and the introduction of horse-drawn trams about ten years later, Peckham became accessible to artisans and clerical staff working in the City and the docks. Housing for this socio-economic group filled almost all the remaining fields except the Rye. In 1868 the vestry of Camberwell St Giles bought the Rye to keep it as common land. Responding to concerns about the dangerous overcrowding of the common on holidays the vestry bought the adjacent Homestall Farm (the last farm in the area) in 1894 and opened this as Peckham Rye Park. With the influx of younger residents with money to spend Rye Lane became a major shopping street. Jones & Higgins opened a small shop in 1867 (on the corner of Rye Lane and Peckham High Street) that would become the best known department store in South London for many years. It closed in the 1980s. In 1870 George Gibson Bussey moved to Peckham and set up a firm described as "Firearms, Ammunition & Shooting” at the Museum Works, Rye Lane, Peckham. The Museum of Firearms was built in 1867. The Ordnance Survey Map of 1868 shows the museum building with a rifle range at the rear extending along the side of the railway embankment for 150 yards. The late 19th century also saw the arrival of George Batty, a manufacturer of condiments, whose main business stood at Finsbury Pavement. The company's Peckham premises occupied 19 railway arches. It was acquired by the H. J. Heinz Company in 1905 as their first UK manufacturing base. The southern end of Peckham was the location for the railway line that once served the Crystal Palace in Sydenham. Though the line was eventually dismantled due to the collapse of the embankment into the gardens of Marmora Road it is still possible to see large sections of it. The flats on Wood Vale and the full length of Brenchley Gardens trace its route. Close by is the Aquarias Golf Club, which is located over the cavernous Honor Oak Reservoir constructed between 1901 and 1909. When it was completed it was the largest brick built underground reservoir in the world and is still one of the largest in Europe. The reservoir now forms part of the Southern extension of the Thames Water Ring Main. Camberwell Old Cemetery, on Forest Hill Road, is a later example of the ring of Victorian cemeteries that were built to alleviate the overcrowding of churchyards that was experienced with the rapid expansion of London in the 19th century. The Stone House at its main entrance was used in the filming of Joe Orton's Entertaining Mr. Sloane (released 1970). It was gutted by fire in the mid-1970s and rebuilt some years later. Camberwell Old Cemetery did not have the grandeur of nearby Nunhead Cemetery, which was one of the original London necropoleis, and once nearing capacity it was replaced by Camberwell New Cemetery on Brenchley Gardens. Brenchley Gardens Park follows the route of the old line to the Crystal Palace culminating at the High Level station. The park runs behind Marmora Road and the remains of the embankment then continues along Wood Vale where flats were built on it. The line was closed in 1954 following a decline in its use after the destruction of the Crystal Palace in 1936 and due to slippage in the structure of the embankment. In the 1930s George Scott Williamson and Innes Pearse opened the Pioneer Health Centre in Queens Road. They planned to conduct a large experiment into the effect of environment on health. 'The Peckham Experiment' recruited 950 families at one shilling (5p) a week. The members joined something like a modern sports club with facilities for physical exercise, games, workshops and socialising with no mandatory programme. The centre moved into a purpose built modernist building by the architect Sir Owen Williams in 1935. North Peckham was heavily redeveloped in the 1960s, consisting mainly of high-rise flats to rehouse people from dilapidated old houses. It was popular on its completion for offering a high quality and modern standing of living. However, high unemployment and a lack of economic opportunities led to urban decay and a period of decline in the late 1970s. The North Peckham Estate became one of the most deprived residential areas in Western Europe. Vandalism, graffiti, arson attacks, burglaries, robberies and muggings were commonplace, and the area became an archetypal London sink estate. As a result, the area was subjected to a £290 million regeneration programme in the late 1990s and early 2000s. After the beginning of the regeneration, the estate gained nationwide notoriety in the media when 10-year-old Nigerian resident Damilola Taylor was stabbed to death on the estate on 27 November 2000. A gang operating in the area is the Peckham Boys. In the early 1990s Peckham was a centre of underground music partly due to a large squat known as The Dolehouse in a disused, 2 floor DHSS building near Peckham High Street. The building was already known for having featured in the cover shot of a 1980s pictorial biography of 1960s' mods, featuring them on their customised scooters outside the then Camberwell Labour Exchange. In 1989 the squatters adopted the name Dole House Crew and along with another local group of squatters called the "Green Circus", held regular gigs/parties in the building. They moved on to many other South East London venues after the Peckham Dolehouse was evicted in late October 1990. A squatted social centre called the Spike Surplus Scheme ran from 1998 until being evicted by the council in 2009. Peckham was one of the areas where riots took place during the 2011 England riots. Since the 1990s the European Union has invested in the regeneration of the area; partly funding the award-winning Peckham Library, a new town square and new housing to replace the North Peckham Estate. State funding is being provided to improve the housing stock and renovate the streets. This includes funding for public arts projects like the Tom Phillips mosaics on the wall of the Peckham Experiment restaurant. 1994 saw the completion of the Peckham Arch designed by architects Troughton McAslan and funded in part by a £1m SRB (Single Regeneration Budget) grant. The arch is due to be demolished to make way for 19 flats; the decision was made despite public protests. The main shopping street is Rye Lane and the large Peckham Rye Park is nearby. Bellenden Road is an area of small independent shops. Peckham has never been an administrative district, or a single ecclesiastical parish in its own right, but it developed a strong sense of identity in the 19th century when Rye Lane was one of the most important shopping streets in South London. The area is identified in the London Plan as one of 35 major centres in Greater London. The area known as Peckham covers a large area of South London and takes in many diverse communities. The British Nigerian community forms a sizeable component of the population of the area, with the area being dubbed "Little Lagos" as a result. A traditional London working class community now coexists with communities that have their origins in Bangladesh, the Caribbean, China, India, Ghana, Nigeria, Pakistan, Turkey, Eastern Europe and Vietnam. As well as these communities there has been a steady gentrification of some of the areas in the south of Peckham and this has meant an influx of cafés, wine bars, niche shops and artists' studios. Peckham is one of the most ethnically diverse areas of the UK. These are the statistics for the ethnic groups in the Peckham ward according to the 2011 Census. This ward is about one-fifth of the place called Peckham, and not representative of the ethnic and cultural distribution in the other four wards. The Ballad of Peckham Rye, a 1960 novel by Muriel Spark, is set in Peckham. Peckham was the setting of the television sitcom Only Fools and Horses, although the series was filmed elsewhere in its run as a regular series from 1981 to 1991, as well as Christmas specials until 2003. The spin-off, Rock & Chips, was also set in Peckham in the 1960s. The television situation comedy Desmond's, made by Channel 4, was filmed and set in Peckham. Also, the comedies Meet the Adebanjos and The Tboy Show (both directed by Debra Odutuyo) were set in Peckham. A 30-minute musical called "We The Ragamuffin" was filmed in Peckham (mainly on the North Peckham Estate). The film used local musicians with an improvised script and was broadcast on Channel 4 in February 1992. The film was written and produced by Russell Newell and directed by Julian Henriques. In 2001, the ITV drama series Bad Girls introduced three characters from Peckham who called themselves The Peckham Bootgang. Peckham is the home of the main character of Dot. Robot by Jason Bradbury. 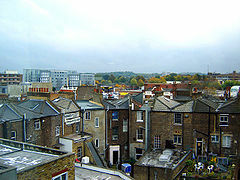 Peckham was home of the fictional character Rose Tyler, a former leading character in the British TV show Doctor Who. The E4 show Youngers is filmed and set in Peckham. Ike Hamilton's character in The Boat That Rocked, Harold, claims to be from Peckham, and stays on the boat facing persecution rather than returning home. In the television series Foyle's War, Series Eight, Adam Wainright, Samantha's husband, is elected in 1947 as Labour Member of Parliament for the (fictional) constituency of 'West Peckham'. Peckham bus garage is currently operated by London Central and is situated in Blackpool Road. It opened in 1994 and replaced a similar but larger facility in Peckham High Street on part of whose site the present bus station now stands. A viaduct behind it carries the railway east of Peckham Rye railway station. ^ a b Mayor of London (February 2008). "London Plan (Consolidated with Alterations since 2004)" (PDF). Greater London Authority. ^ a b UK Census (2011). "Local Area Report – Peckham 2011 Census Ward (1237320209)". Nomis. Office for National Statistics. Retrieved 8 February 2018. ^ "Crystal Palace (High Level) – Nunhead". London's Abandoned Stations. Retrieved 17 July 2008. ^ "Changing face of Damilola estate". BBC News. 25 April 2002. Retrieved 22 May 2010. ^ King, Lorraine. "The inside story of gang life in Peckham", The Guardian, 11 February 2007. Accessed 9 August 2011. ^ Frame, Pete (1999). Pete Frame's Rockin' Around Britain: Rock'n'roll Landmarks of the UK and Ireland. Music Sales Group. ISBN 978-0-711-96973-5. ^ "London riots: 'Everyone was very fired up'", BBC News, 9 August 2011. Accessed 9 August 2011. ^ Spring, Martin. "Will Alsop's Peckham library revisited", Building, 20 March 2009. Accessed 9 August 2011. ^ "Peckham Square". mcaslan.co.uk. John McAslan + Partners. Retrieved 15 July 2017. ^ "London's Little Lagos - A look at Nigerian life in the British capital". Retrieved 1 June 2018. Wikimedia Commons has media related to Peckham.